Today we celebrated Emma in a special way. Obviously, she could not be baptized again, as that was done the day of her birth. 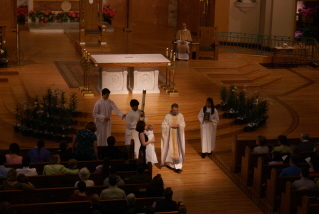 But we were able to go through this beautiful liturgy. Emma's mom opted to have this done during the Mass in her Parish where she usually attends. The godparents were two more of our children, who flew long distances to be here and to support their sister in this. 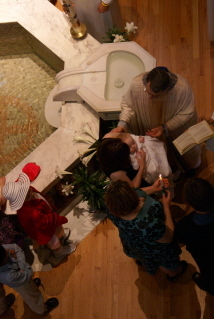 If a child was baptized in danger of death, the Rite of Bring a Baptized Child to the Church may be celebrated. 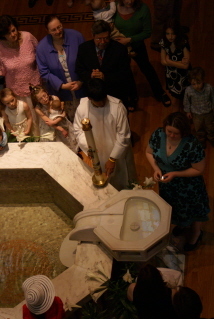 This rites celebrates all the additional ceremonies of the baptism rite including the reception and welcoming of the child, anointing, clothing with the white garment, presentation of the candle, and blessings. 165 The people may sing a psalm or song suitable for the occasion. Meanwhile the celebrating priest or deacon, vested in alb or surplice, with a stole (with or without a cope) of festive color, and accompanied by the ministers, goes to the entrance of the church where the parents and godparents are waiting with the child. 166. The celebrant greets all present, and especially the parents and godparents. He praises them for having had the child baptized without delay, and thanks God and congratulates the parents on the child's return to health. Celebrant: What name have you given the child? 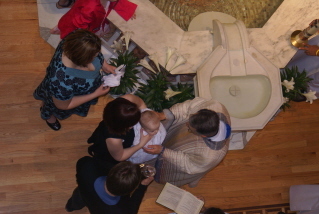 Celebrant: What do you ask of God's Church, now that your child has been baptized? Parents: We ask that the whole community will know that he (she) has been received into the Church. The first reply may be given by someone other than the parents if local custom gives him the right to name the child. In the second response the parents may use other words, such as that he (she) is a Christian or that he (she) has been baptized. Celebrant: Do you realize that in bringing your child to the Church, you are accepting the duty of raising him (her) in the faith, so that by observing the commandments he (she) will love God and neighbor as Christ taught us? Are you ready to help the mother and father of this child to carry out their duty as Christian parents? N., the Christian community welcomes you with great joy, now that you have recovered your health. We now bear witness that you have been received as a member of the Church. In the name of the community I sign you with the cross of Christ, who gave you a new life in baptism and made you a member of his Church. I invite your parents (and godparents) to do the same. He signs the child on the forehead, in silence. Then he invites the parents and the godparents to do the same. Father of our Lord Jesus Christ, source of all life and love, you are glorified by the loving care shown this child. You rescue children from danger and save them in baptism. Your Church thanks you and prays for your child Emma. You have brought her out of the kingdom of darkness and into your marvelous light. You have made her your adopted child and a temple of the Holy Spirit. Help him (her) in all the dangers of this life and strengthen her in the constant effort to reach your kingdom, through the power of Christ our Savior through Christ our Lord. God the Father of our Lord Jesus Christ has freed you from sin, given you a new birth by water and the Holy Spirit, and welcomed you into his holy people. He now anoints you with the chrism of salvation. As Christ was anointed Priest, Prophet, and King, so may you live always as a member of his body, sharing everlasting life. 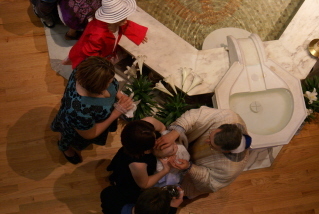 Then the celebrant anoints the child on the crown of the head with the chrism, in silence. N., you have become a new creation, and have clothed yourself in Christ. See in this white garment the outward sign of your Christian dignity. With your family and friends to help you by word and example, bring that dignity unstained into the everlasting life of heaven. 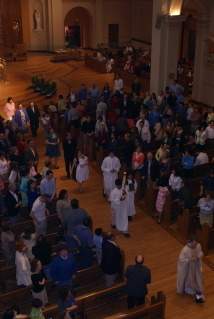 Someone, such as the godparent, lights the child's candle from the Easter candle. Parents and godparents, this light is entrusted to you to be kept burning brightly. This child of yours has been enlightened by Christ. He (she) is to walk always as a child of the light. May he (she) keep the flame of faith alive in his (her) heart. When the Lord comes, may he (she) go out to meet him with all the saints in the heavenly kingdom. There was also a wonderful blessing at the end of mass, but I haven't been able to find the text. I am also not sure that the texts above are completely accurate, but they are what I could find. Who knew? Great post. The Church always seems to have her bases covered, and this is a great example of that. What a lovely day. How lovely. Thank you for sharing this. 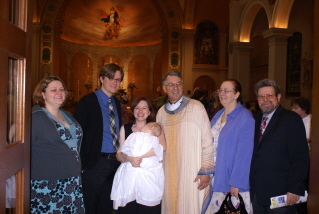 It is wonderful that having an emergency baptism didn't deprive the family of going through the church ceremonials. Thank you for posting this. It helps those of us who could not make the ceremony to share the joy with all of you. It is truly beautiful. Who took the pictures? Thank you for your post re: Welcoming Ceremony, my son will have the same ceremony on June, he was baptized in emergency circumstances when he was 2 weeks old. This page contains a single entry by alicia published on April 6, 2008 4:57 PM. veritas? was the previous entry in this blog. interested? is the next entry in this blog.